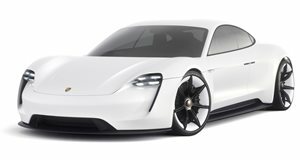 We'll have to wait until September for the covers to come off Porsche's first fully electric car. Porsche recently previewed the Taycan with some official teaser sketches, the company’s first electric car in its 70-year history. This, however, is our best look yet at the new Taycan in production form, as the automaker has released some new teaser images showing the electric sedan wearing some colorful camouflage ahead of its debut in September. We get a clear look at the front headlight design, which appears to retain the same design as current models like the current 718 Cayman and Boxster sports cars with quad-LED daytime running lights. At the back, previous teaser shots have confirmed the Taycan will have a full-width light bar like the new 911. In terms of specifications, we already know that two electric motors will produce a combined output of more than 600 horsepower, enabling the sedan to sprint from 0-62 mph in less than 3.5 seconds. The battery pack will also provide enough juice for a range of over 310 miles in the NEDC testing cycle and take only four minutes to recharge to provide a range of 62 miles. After the Taycan goes on sale by the end of this year, a more practical Cross Turismo version will arrive "soon afterwards” in 2020. The Taycan range will undoubtedly be an important one for Porsche, as the automaker predicts that electrified cars will make up over 50 percent of its sales by 2025, including fully electric and plug-in hybrid models. Porsche has already received 20,000 orders for the Taycan, and demand is so high that Porsche has had to boost production.